A mobile phone application that powerfully supports users in the construction of multimedia “narratives” as it allows digital multimedia to be combined in creative and useful ways. The application runs on a standard Android phone, and there is also a lower-functionality version compatible with the Symbian phones (currently) commonly used in low socio-economic status communities. The application affords both practicality and originality. Each narrative can include any number of frames. Each frame can include an image, up to three layered audio tracks, even text content. Supporting the diversity of users, needs, and imaginations, the interface is completely flexible, and all elements of each frame are optional. For example, the application can be used as an annotated photo diary, a simple audio recorder, text and sound tool for discussion about current events, even a multimedia survey tool. Narratives can be created from an empty canvas or, alternatively, produced from templates one can pre-load into the application. There are no size or duration limits – the aim is to allow stories of any length or structure. 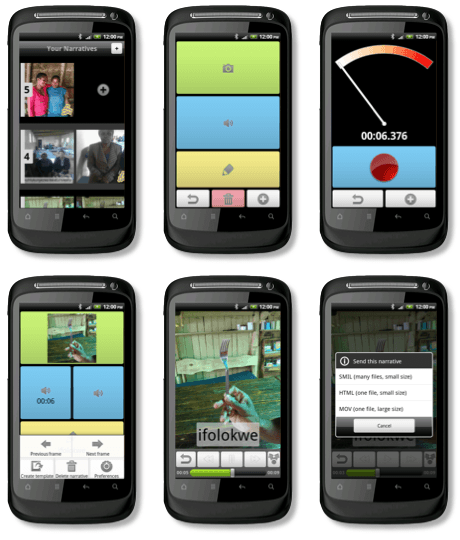 Produced narratives can be played back on the phone or shared with others using the application’s export feature. The application is fully compatible with Com-Tablet, exporting SMIL media packages with small file sizes appropriate for the low-capacity devices that are common in the communities that the application is designed for. In this form, original media items are preserved, so other users can easily adapt or build upon the original story. Additionally, narratives can be exported as movie files (for upload to YouTube, for example) or, conveniently, as a webpage that can be put online directly. The application, source code (Android version license: LGPLv3; Java ME version license: Apache) and full documentation are freely available as part of the toolkit. Com-Phone has been extended to create Com-Note, which helps musicians collaborate and share ideas during the composition process. Have you built on Com-Phone? We'd love to hear about it – please get in touch.